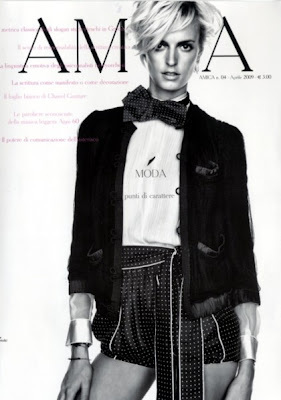 Jacquetta Wheeler You might not know the name but if you follow the runways, and print ads you know the face. Yes another British aristocrat discovered on the streets of London by Mario Testino and by the age of 17 she had graced the covers of all the european vogues, by 19 the fashion industry declared her the 'Model of the Millennium'. For the past decade Jacquetta has also been one of the few rebel models who loves to change her hair and hair color, paving the way in defying the traditional standards in the modeling world (models don’t change their hair). After taking a year off in 2008 and coming back this year as one of the faces for Gucci and walking down some of the springs 2010 runway shows sporting her blonder tresses, Jacquetta remains as one of the Super Models of this decade to watch for constant reinventions with her hair and color.